Etsuko Ichikawa, Leaving a Legacy, Orb installation, 2017. Hot sculpted glass with uranium, installation. 40 x 42 x 42 in. 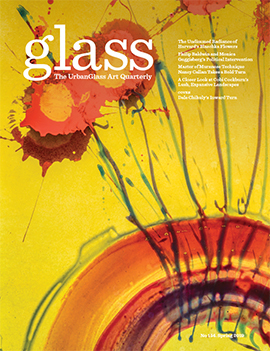 Through February 16th, the artist featured on the cover of Glass Quarterly's Fall 2018 edition (#152), Etsuko Ichikawa, is exhibiting at the Winston Wachter Gallery in New York City. Ichikawa was born in Tokyo and is based in Seattle. The title of the exhibition, "Vitrified, is also the title of the body of work itself. In this series as well as in much of her other work, Ichikawa is concerned with the "various impacts of human existence on our environment." What drove this particular body of work was the artist's shock at the 2011 Fukushima nuclear disaster in her native Japan, which caused a mass amount of radioactive material to be released into the air. 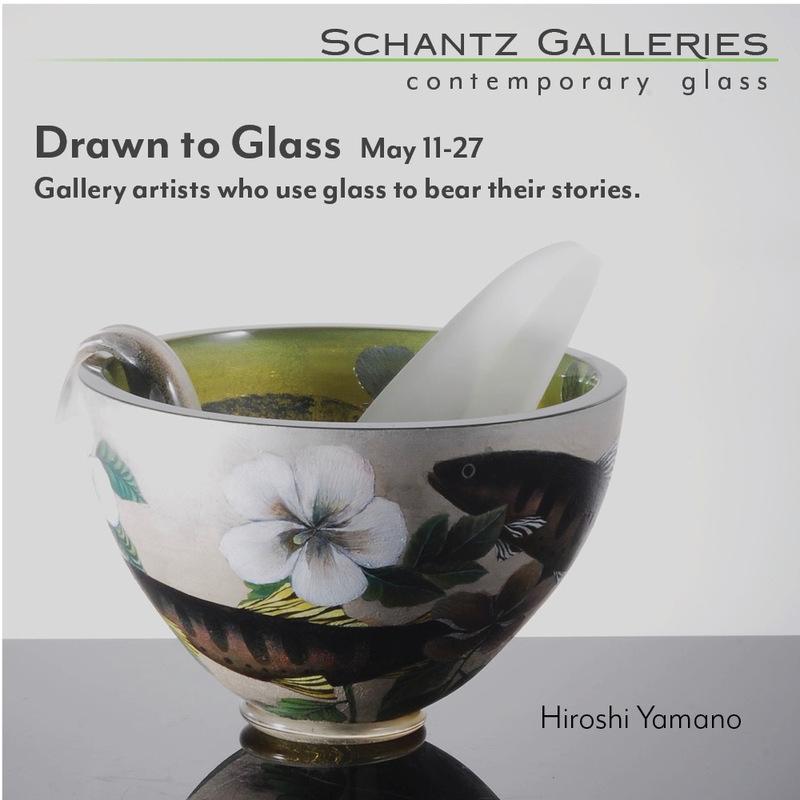 Based in Seattle, Ichikawa creates visual abstractions through glass that echo the frightening yet mesmerizing draw of chemical power, stirring up in her audience a complicated mix of fear and entrancement. 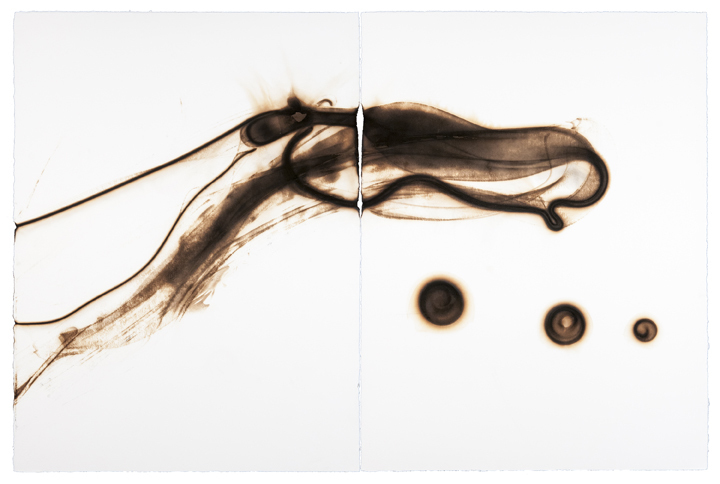 The series includes watercolor and pyrography (drawing with molten glass) on paper, video, and glass sculptures. In the 2018 fall issue's cover story, contributing writer, Victoria Josslin writes, "Together, they [the various media] unify the artist's concerns as she intertwines narrative, beautiful objects, and distress." 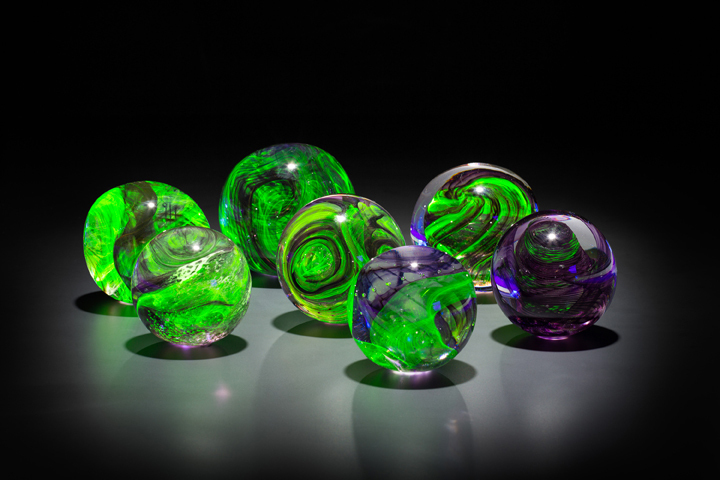 One installation in the series, Leaving a Legacy, consists of uranium glass orbs resting within notches on a table, inspired by a procedure used at the Hanford nuclear site in Washington State. At Hanford, liquid nuclear waste goes through a process of "vitrification" so that it can be disposed of more safely. The waste gets combined with molten glass and solidifies. The sharp swirls of green made from uranium in Ichikawa's orbs "produce a beautiful but unhealthy glow, reminding you of the winds and tides that circle the Earth or the movement of our own body fluids, all corrupted," says Josslin. 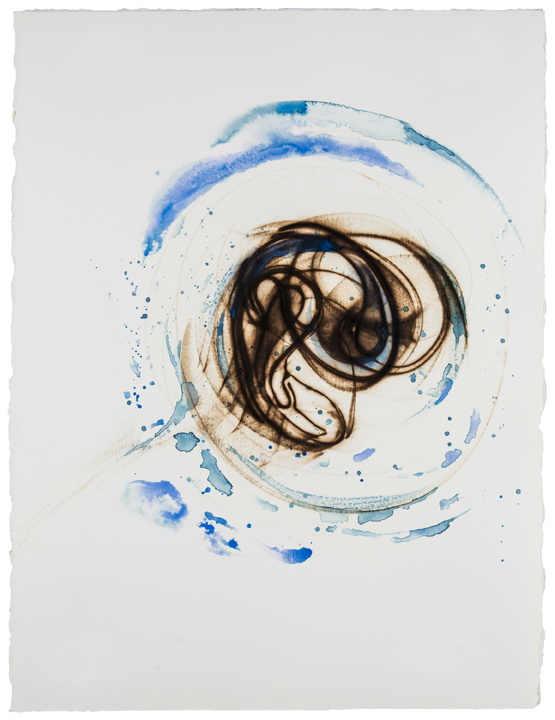 Etsuko Ichikawa, Trace 2314 (Framed), 2014. Glass pyrograph on paper. 30 x 22 1/2 in. Included in the exhibition is a short film also called Vitrified. A figure wearing a hazmat suit finds one of the glass uranium orbs in a forest and carries it to the beach. A soft voice, as it is put on the Winston Wachter website "muses on the connective, destructive and eternal natures of water, which enables life and links everything in the world," while the camera pans over vast landscapes of Washington's Olympic Peninsula. The scene produces an overwhelming sense of the vastness and sublimity, focusing on the immensity of water, an element entirely out of our control yet so much a part of us and our environment. 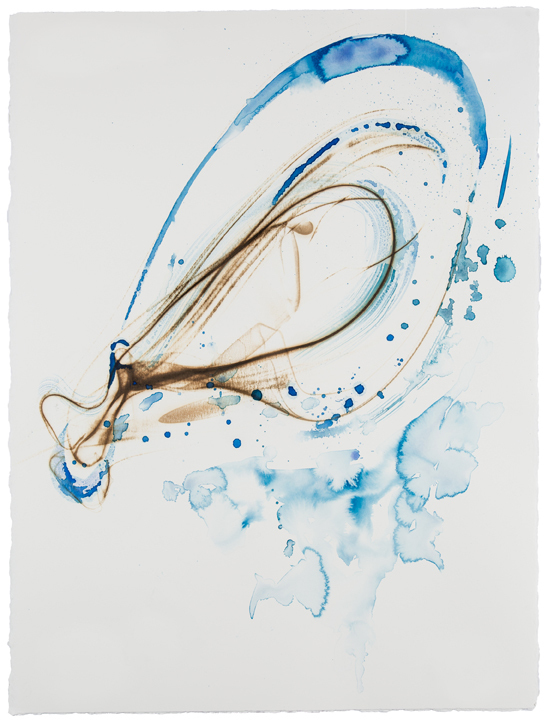 Water is a central motif throughout the series. 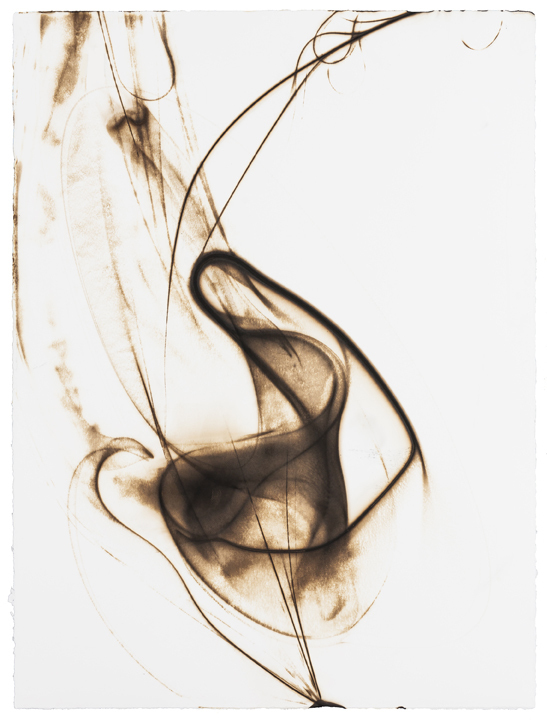 The works on paper are made with fire and water through the techniques of pyrography and watercolor. 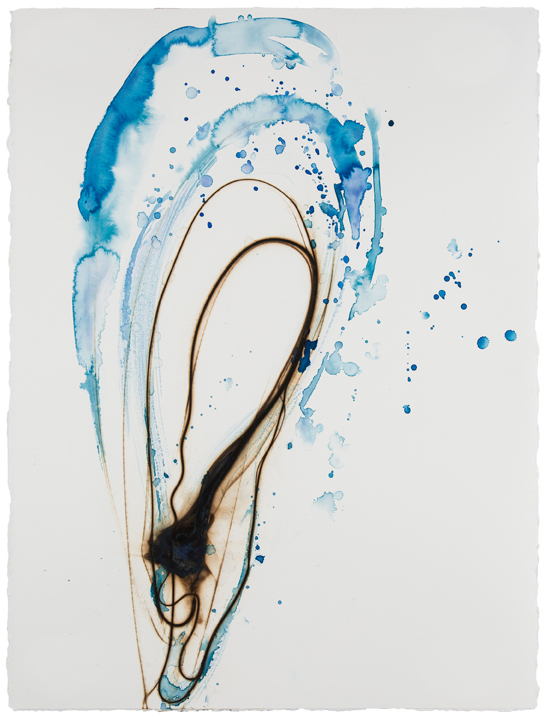 These elegant abstractions are in Josslin's opinion like "ocean maps." Ichikawa is fascinated with these contradicting elements and uniting them to create fluid, liquid patterns she translates the same intensity of her installation and video work to the two-dimensional. Etsuko Ichikawa, Vitrified 6718 (Framed), 2018. Glass pyrograph and water color on paper. 30 x 67 1/2 in. There is a beautiful synchronicity across each piece in the exhibition. Each ties into the next, instilling in the viewer an understanding of the constancy of earth's elements, good and bad. All the work in the 2018 exhibition and thus also the upcoming one at Winston Wachter, according to Josslin, "arises from Ichiwaka's attention to the ripple effect of nuclear waste in general and the ring of Fukushima cesium in particular as it expands throughout the world....Ichiwaka quietly forces her viewers to confront what we ultimately must understand: We create disasters that cannot be erased." The upcoming exhibition at Winston Wachter will include the same three elements mentioned by Josslin with the same powerful message persisting across the multi-media display. Like the earth's natural elements they depict, the works in this series take on a life of their own, they cannot be tamed and form their own cohesive narrative that, in turn, takes us for not just a visual but a sensory and emotional ride.